Here is a recent commission I was asked to do by comic art fan/collector Kevin Moorhead. Kevin, who commissioned me awhile ago to do a cover recreation of the Frank Miller/Al Milgrom cover to Incredible Hulk #258 (which you can see here) asked me this time to do an imaginary cover for Savage She-Hulk Annual #1... featuring the She-Hulk versus classic Hulk villains the U-Foes (who Kevin had me feature in the previous commission, replacing the Soviet Super-Soldiers). 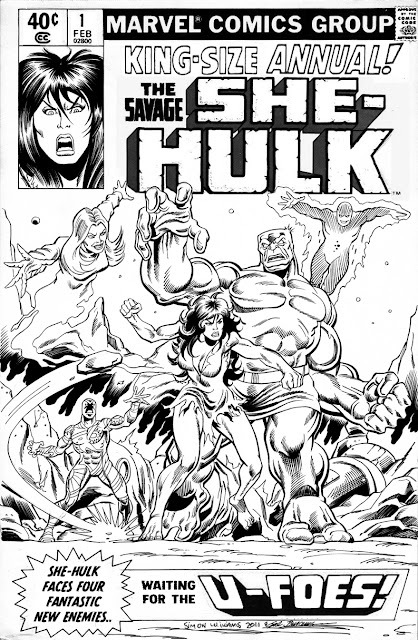 In Marvel continuity, it was the Hulk who first did battle with the U-Foes (in Incredible Hulk #254)... but for the purposes of this commission, Kevin asked if I could do a 'What-If' style cover, in which the She-Hulk is the first to battle the villainous U-Foes, who were created by Marvel Legend Bill Mantlo. "Seriously, how is it possible that Simon isn't drawing something for one of the big guys? Seriously! I've loved Simon's Bronze Age look since I first saw it. Such a wonderful mix of the Buscema's styles. Sal's poses and John's curved lines. After the first commission that I got from him (the Hulk cover) turned out so well I knew that one day I'd want to ask for something else. A few months back he and I started talking about just what that'd be. I forget what I originally suggested but it very quickly came to She-Hulk vs. the U-Foes (Vector, Vapor, Ironclad and X-Ray). Simon stepped up to the plate and went for a full cover. A long lost original cover for She-Hulks first annual. At the time I was only able to go with the pencils but still, ~man~, was it a good looking piece of work. The Savage She-Hulk... versus the U-Foes! Pencils by Simon Williams, Inks by Sal Buscema. To say that having Sal ink my work is a dream come true... well, that is a huge understatement... but to hear that he likes my work as well really means so much to me. I'd like to say a big thank you to Sal not only for the kind words, and also for the many years of joy and inspiration that his work has given me. Plus the stella job he did inking this piece as well. Plus of course, big BIG thanks to Kevin for making this happen!